Oracle Application Express (APEX) is a low code development tool for building web applications on the Oracle Database. APEX allows you to develop and deploy responsive web applications through a browser, either on premise or in the cloud using only a web browser. The use cases for APEX range from spreadsheet replacement to enterprise systems used by thousands on a daily basis, via Forms modernization, EBS Extensions, APEX also runs Oracle Corp! What are some examples of APEX applications? Oracle use APEX to develop their own applications, so the best examples are probably their own: www.apex.oracle.com, livesql.oracle.com and shop.oracle.com. How do I create an application for my spreadsheet? An application can be created from a spreadsheet within a few minutes, by stepping through a few simple, declarative steps of a wizard. Straight-forward and quick. How do I create a mobile APEX app? Applications built for Desktop are perfectly adaptable for mobile with the responsive design of APEX’s Universal Theme. How to extend eBusiness Suite? Avoid customisations in eBusiness Suite by seamlessly integrating with APEX applications. Navigating from EBS Menus, there’s no need to reauthenticate and access to functionality within APEX applications can be controlled by EBS user responsibilities. Make your APEX application look and feel like EBS or your Corporate colours too using the Universal Theme. How do I pronounce APEX? It’s a fully supported, no-cost option of all versions of the Oracle database from 11g. APEX is a fully supported feature of the Oracle Database. If you are supported for Oracle Database or have an Oracle Database Cloud Service, you are supported for APEX. APEX is a key component of the Oracle Database and Oracle DBaaS Cloud service, APEX is continuously being improved by Oracle. The current statement of direction consists of further improvements to the remote data access capabilities (continuously updated REST features) and multiple on-going UI improvements such as integrations with Oracle’s JET library. What is the future of Oracle Forms? An ever decreasing “Forms-first” developer skillset making staff retention and new employment difficult and expensive. Should I use APEX or Java? If you already have your data and business processes in an Oracle Database then the answer is almost certainly APEX, you will find you will be able to build your application much quicker and for a lower cost. Choose the right horse for the right course! APEX is extemely scalable – it can scale with your database. As the database takes advantage of features to meet performance, availability and big data requirements, so APEX can benefit – it is built on top of the database. What is the Universal Theme? Universal Theme is a responsive, versatile, and customisable user interface for your Application Express apps. Choose from a variety of components that respond to the user’s device and that can be effortlessly styled to fit your branding and colouring. Where do I learn APEX? Where do I host my APEX application? The Oracle Cloud is the best way to host an APEX application. How do I deploy APEX in the cloud? In the same way you would deploy to any Oracle Database environment. This is a sandbox environment suitable for education, training, demos and any non-commercial usage. It is the first to receive updates to the latest version of APEX. What skills do I need to use APEX? As well as standing for Rapid Application Development, Oracle have started using the #OracleRAD hashtag, standing for REST APEX Database – the whole stack you need to create an application. How do I migrate from Oracle Forms to APEX? There is no tool to migrate your Oracle Forms application to APEX or any other technology. At Explorer we are extremely experienced in analysing Oracle Forms applications and helping clients build new APEX applications which leverage their existing code. Upgrading APEX is as simple as running a script on the database. Existing applications will be automatically upgraded and should mostly work without any code changes. Difference between Salesforce APEX and Oracle APEX? Salesforce is a stand-alone CRM product and is completely un-related to Oracle APEX. ‘Salesforce APEX’ allows Salesforce developers to execute flow and transaction control statements on Salesforce servers in conjunction with calls to the API. What is the APEX community? How to use APEX for reporting? It is easy to create reporting solutions with Oracle APEX. Interactive reports allow users to manipulate a results set to give them their own view of the data. These reports can be saved for future use and even saved for all users to access. How to create documents with APEX? There are many tools available to create documents from APEX (PDF, DOCX, XLSX etc). 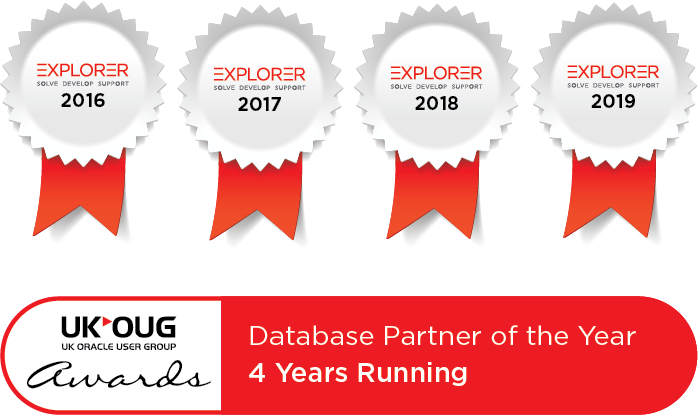 Explorer choose to use and partner with PLPDF which resides in the database and allows documents to be created from within PL/SQL code and in APEX applications. Low cost, easy to use and great support. Are there events for Oracle APEX? The UKOUG Technology event is the biggest in the UK with a dedicated APEX Stream, there is also events hosted in the South, Midlands, North, Scotland and Ireland. Meetups are held frequently in Leeds, UK. Throughout Europe the biggest APEX events are organised by NLOUG & DOAG. In the states; ODTUG are organisers of the annual KScope event. Are there blogs on APEX? Where do I find APEX contractors/developers? Explorer have a team of APEX developers that can develop applications or work with you to help you develop your own. What is Oracle Statement of Direction for APEX? What is APEX architecture best practise? How often do you run APEX training courses? Explorer run courses in Leeds a number of times each year. We can also deliver training courses at customer sites depending on the number of people that need to be trained. How to improve APEX performance? APEX performance is directly linked to the database and 99% of performance issues end up being the results of poorly written queries or missing indexes.